Yep, it’s damn cold here in Ottawa, leading to a lot of staying indoors and cooking. Which is leading, somewhat ironically, to some good use of my freezer. My hubby is out, and the kids are miraculously both asleep, so I thought I’d write a little post about how things have been going with that particular new appliance. First of all, I will reiterate just how happy I am that I bought it back in August. I probably haven’t put it to ideal use, but it has been a wonderful tool for organizing meals. With the freezer, I can cook when I have the time, and put stuff away for when I have less time. It’s been a wonderful way to save money and time, not to mention the brainwork involved in planning meals. Over these past few months, I’ve learned some things about what freezes well and what doesn’t. I’ve discovered it’s true: potatoes don’t freeze well. They turn sortof mealy and mushy and unappentizing. Beans also go a bit weird in the freezer, acquiring a strange spongy texture. I’ve also discovered that anything dry in chunks tends to get drier and freezer burnt. 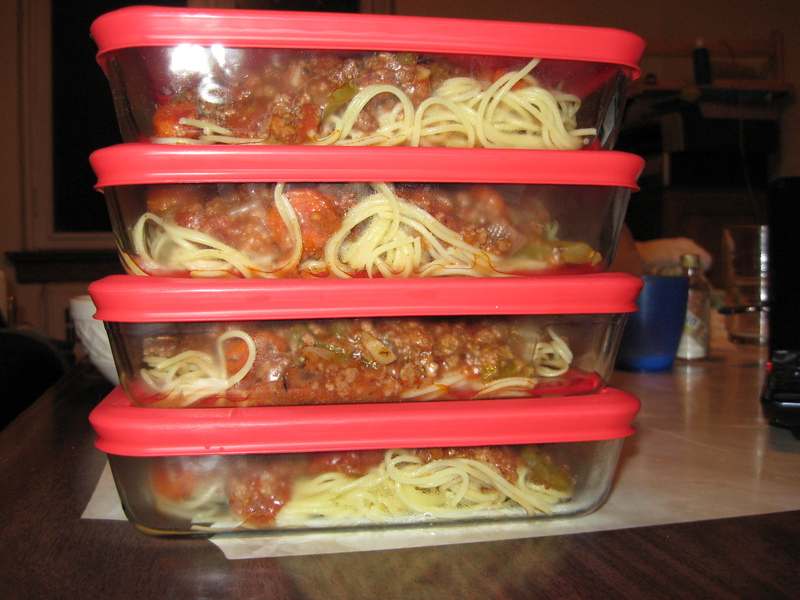 But there are many things that have been great in the freezer, especially meaty saucy things like spaghetti and chili. Chicken broth is great because I usually make big quantities and then freeze in 2-3 cup packs. When I need some for soup or a sauce, I just defrost what I need. For all of these liquidy things I’ve fallen in love with Zip-Lock baggies. Just fill up and squeeze all the air out, then lay flat on top of one another and they take up so little space. Not very eco-friendly but you can re-use the baggies. I was surprised to find out that my pizza packages worked really well. I made pizza dough and sauce the other day and decided to make one and put 2 in the freezer. So I portioned out the dough and slipped the 2 extras into baggies with a little oil in them. I then put 1/2 cup of sauce in a baggie for each pizza. For the cheese, I shredded a whole 500 g block of mozzarella and divided it into 3 portions. For the 2 extra pizza packages, I put the 3 smaller baggies-dough, sauce and cheese-together into a larger zip-lock. The other night I tried one of the pizza packs, which I had placed in the fridge overnight to defrost, and was thrilled with the result! Tasty crust, fresh-tasting sauce and melty yummy cheese, just like day 1. Another good find was regarding the tomatoes I froze in the summer. Late in the summer I got a big bunch of heirloom tomatoes from the farmer’s market. I used some and froze some whole in zip-lock bags. I had read somewhere that all you do to skin them is dunk the frozen tomatoes in boiling water for 30 seconds and the skins peel right off. Tonight I realized I had no canned tomatoes for my veggie chili, so I grabbed a bag of frozen ones. Luckily it worked like a charm! Some other slightly stranger things I’ve got stowed away in there include crabapple juice and pulp which I intend to make into jelly and butter respectively; spinach and blueberry puree, sweet potato puree and acorn squash puree, waiting to sneak their way into some food some day soon; baggies of wine which I will use for cooking . . . But the strangest item of all requires a word of warning: If you come over to my house, don’t get tempted by that ice cream container sitting in the freezer. It’s not ice cream. It’s a placenta.